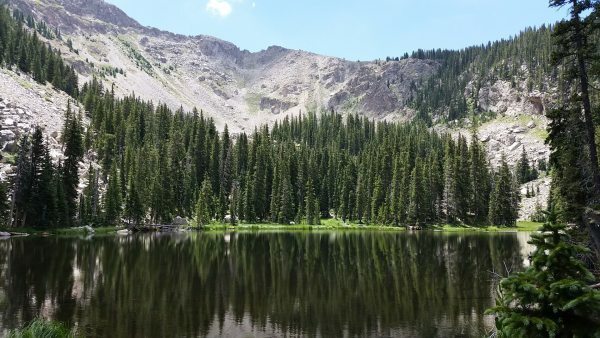 This week's hike was to Nambé Lake, high in the Sangre de Cristos above Santa Fe. It's a gorgeous spot, a clear, shallow mountain lake surrounded by steep rocky slopes up to Lake Peak and Santa Fe Baldy. I assume it's a glacial cirque, though I can't seem to find any confirmation of that online. 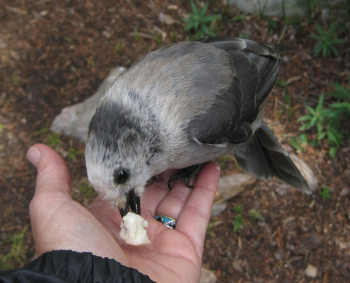 There's a raucous local population of grey jays, fearless and curious. One of my hiking companions suggested they'd take food from my hand if I offered. I broke off a bit of my sandwich and offered it, and sure enough, a jay flew right over. Eventually we had three or four of them hanging around our lunch spot. The rocky slopes are home to pikas, but they're shy and seldom seen. We did see a couple of marmots in the rocks, and I caught a brief glimpse of a small, squirrel-sized head that looked more grey than brown like I'd expect from a rock squirrel. Was it a pika? I'll never know. We also saw some great flowers. Photos: Nambé Lake Grey Jays.